As timeless and classic as they come, this round brilliant cut flanked by tapered baguettes is both simple and exquisite. Modern baguette cuts were developed in the early 20th century when the Art Deco period was in full swing. The geometric and linear designs emerging helped to shape the fashions in fine jewellery too. 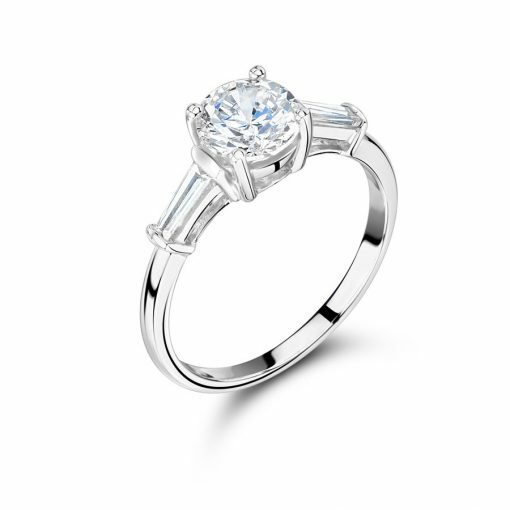 This style is available in 18k white, yellow, and rose gold, and also platinum. Voltaire Diamonds have a wide range of beautiful stones. If we do not have the stone that you are seeking in stock, we are happy to source it for you. Book your appointment today by calling our office in Dublin or London, whichever is more convenient.